If Booster Gold had seven costumes and Doomsday destroyed two of them, how many costumes remain? Artist Derec Donovan has drawn Ame-Comi Girls and Batman '66 for DC Comics. And now he's drawn Booster Gold, too. Donovan posted this recent commission on Twitter as @DerecDonovan74. If you like what you see, you might want to know that he's still taking orders for Christmas commissions through December 15. 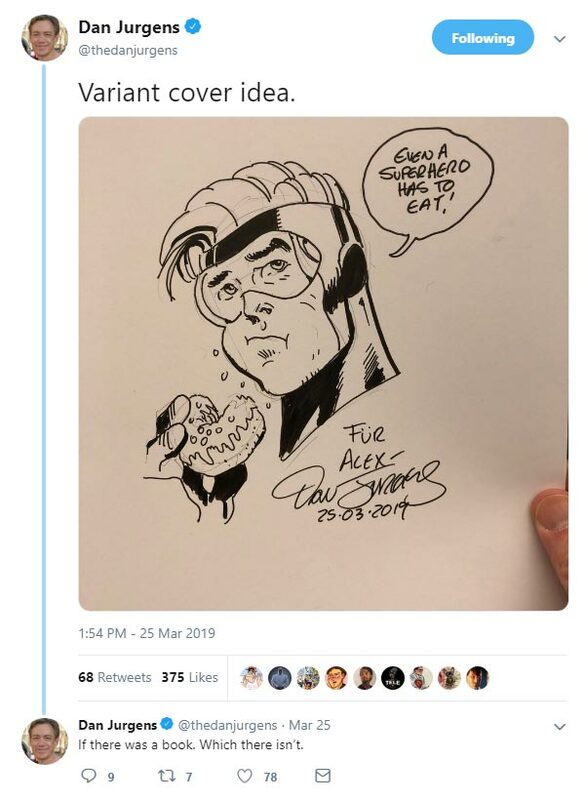 Something must have been in the air this week as I was emailed by two different people out of the blue who were proud to show off their recent Booster Gold sketch commissions! 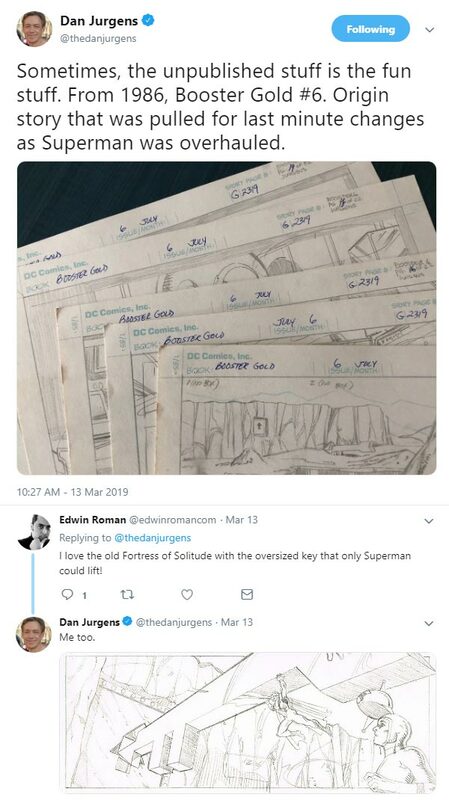 Those are some good looking sketches, guys. Thanks for sharing. If Booster Gold stole six super powers and then stole eight more, how many super powers has he taken in all? 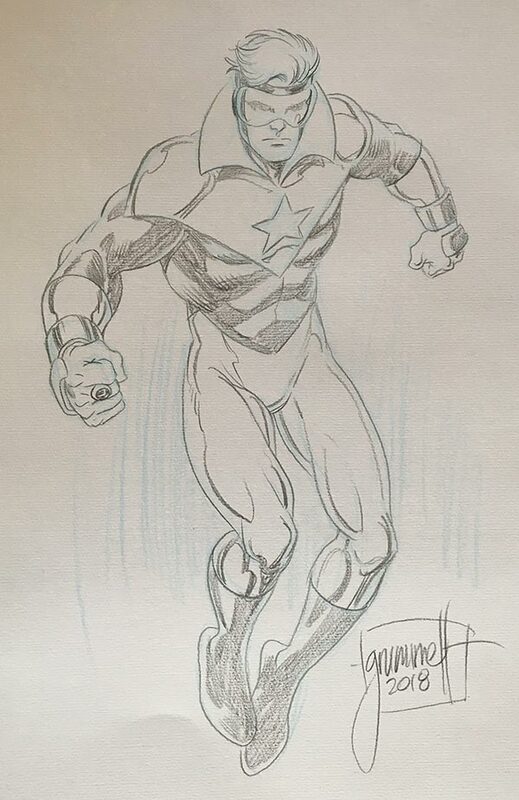 Herbert Fung has been going to the Calgary Comic & Entertainment Expo for years, and more often than not, he seems to bring back a Booster Gold commission from a superstar artist. It was Adam Hughes in 2013, David Finch in 2014, and Ty Templeton in 2016. Oh, boy, that looks good! I'm gold with envy, Herb! Grummett's credits are diverse, but I'll always think of him as THE artist for Superboy. 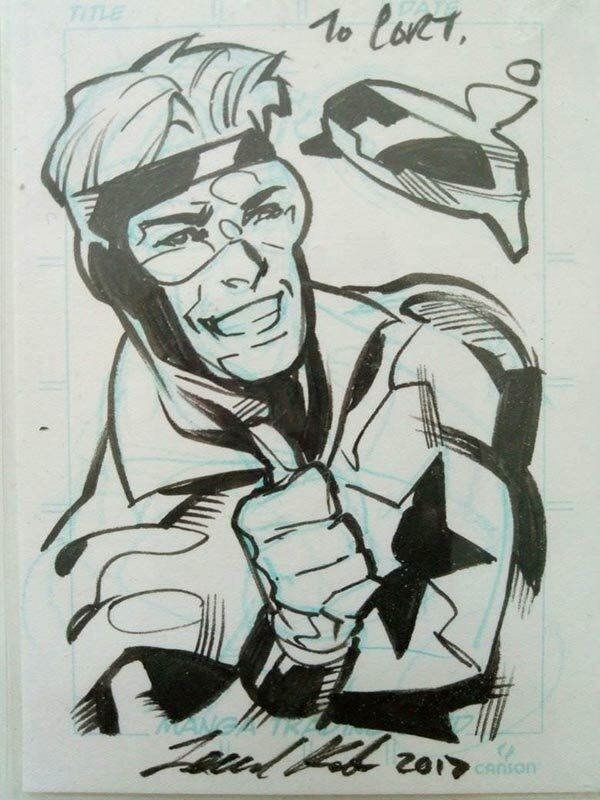 After seeing this, I'm inclined to put him near the top of my list of Booster Gold artists as well. oh man, that's wonderful! Great score!!! That is awesome Herb. Tom is from my home town of Saskatoon and my LCS owner is friends with him, so I was luck enough to get him to do a Superboy sketch cover on Action Comics 1000! Jonny Michel, who shared some artwork with Booster boosters back in October, got in touch with more commission news. I recently got engaged to the wonderful lady who purchased me these Chris Giarrusso commissions. In celebration, I went nuts. I did something I normally never do. 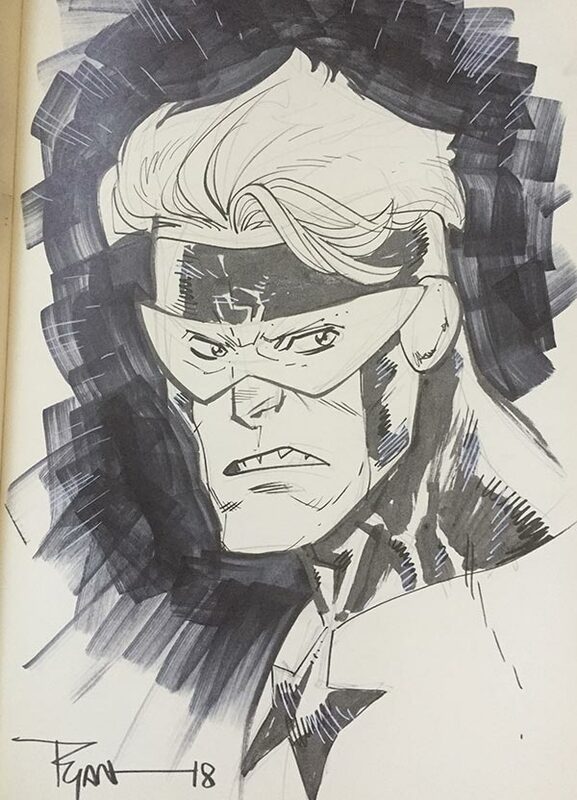 I went out and purchased a semi-expensive commission off of eBay.com from one of my favorite DC artists, Ethan Van Sciver. On top of the amazing sketch card I received in the mail, Ethan also filmed the entire sketching process and commentary and posted it on his Youtube channel! 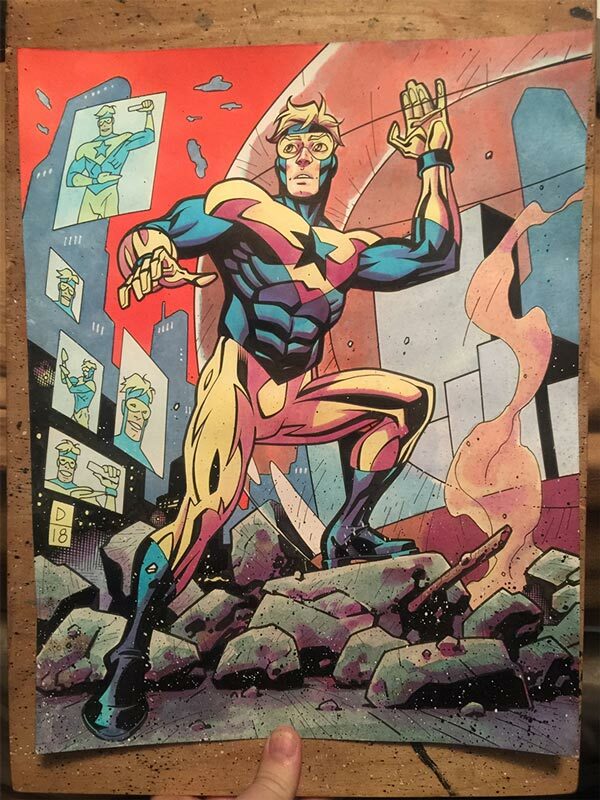 So, not only do I have this beautiful Booster Gold drawing (with an excellent *classic* popped collar and Ethan’s take on Skeets), but I also have a 45 minute video of how he made it! Seriously, how cool is that? Unfortunately, upon watching the video, I learned the one devastating blow this sketch is to the Booster Gold community. In this video, we learned that Booster Gold ... is one of Ethan Van Sciver's least favorite DC characters ... and I was the goof that asked for the commission. Please, hold back your screams of shock and terror. I know. It's crazy. Ethan actually offers a really good reason why this is though. Basically, he hasn’t gotten the chance to get into Booster Gold by drawing and learning about his story. Luckily, by the end of the video, I feel like he was kinda getting into it, especially when he started drawing the collar. See? The collar is important! If Booster Gold had six dollars and earned nine more, how many dollars does he have in all?